"The History of Space Age Pop"
Space Age Pop frames a period, roughly 1954 to 1964--from the dawn of high-fidelity (hi-fi) to the arrival of the Beatles. At its inception, hi-fi (and subsequent stereo) technology provided record companies with a showcase for the pan-galactic spectrum of audio reproduction. Artists like Esquivel, Enoch Light and Sauter-Finegan led the way in showing off their studio smarts. A decade later, the British Invasion, accompanied by Dylanesque cultural and political upheaval, altered popular music forever; the most renowned instrumental pop artists changed their courses correspondingly, or disappeared from vinyl. 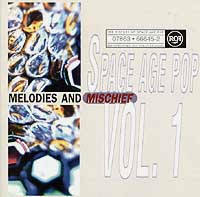 The History of Space Age Pop focuses on an epoch that pre-dates popular acceptance of electronic sound generation. For the most part, these recordings were made with conventional acoustic and electric instruments. There's an occasional theremin or ondioline, but no synthesizers. Classic Space Age Pop even pre-dates the Moog (introduced in 1964). The state-of-the-art studio toolkit included tape speed manipulation, mutli-tracking, controlled distortion, reverb, equalization and tape editing (with razor blades). Conductors assumed the roles of magicians; engineers became alchemists. Despite similarities in big band instrumentation, these recordings were light years from Glenn Miller. It should be pointed out that the phrase "Space Age Pop" wasn't in vogue when this music was created. That term arose during the mid-1980's, when cultural trashpickers--underground cartoonists and free-form DJs--were scavenging through thrift store bins and used record shops, paying 50 cents an armload for the stuff--because nobody else wanted it. Moreover, the vinyl archaeologists who bought those castoff relics developed a new (or in some cases renewed) appreciation for the quirky signals etched in the grooves. The producer credits Los Angeles artist Byron Werner with coining the phrase "Space Age Bachelor Pad Music"--later shortened to Space Age Pop by the producer. This music was popular when it was originally released. It was a great way to test the capabilities of a new stereo--or the limits of your neighbor's patience. But after a decade of glory, the novelty wore off and the music became outdated, superseded by higher-tech hijinks and countercultural weirdness. A zillion trends have come and gone--mostly gone--since. There was bound to come a time when the cocktail-glass tintinnabulations of Bob Thompson or the springy rhythms of the Three Suns would become fashionable again. Though many bandleaders (such as Henri Rene and Bob Thompson) composed, most relied on radical reworkings of Tin Pan Alley standards, or borrowings from the classical repertoire. Juan Garcia Esquivel, asked why he often used such familiar material for his eccentric orchestrations, explained, "When a listener hears a song he's familiar with, he likelier to notice differences in the rhythm, or the chords, or the voices. He's likelier to appreciate the work of the arranger." And when it came to Space Age Pop, arranging was the name of the game. There seemed to be a competition among artists to see who could conduct the most outragious gene-splicing on an old pleasantry like "Sentimental Journey" or "Mood Indigo." Occasionally, efforts sounded contrived; some titles were overdone. After years of studying the genre, these ears ask to be spared further variations on "Flight of the Bumble Bee," "Humoresque," or "Greensleeves." On the other hand, there's rarely a "3rd Man Theme," "Hell's Bells" or "Powerhouse" that fails to satisfy. And it seems almost impossible to make a bad recording of "Caravan." Sir Julian (Gould)'s VU meter-pinning version included here also rates high on the weirdness scale. A sense of humor was an essential component of any arranger's skills. Esquivel specialized in sophisticated nosetweaking, as did the Three Suns. Henry Mancini's Latin send-up of "Springtime for Hitler" (from the Mel Brooks farce, The Producers) take a devastatingly dark joke one step beyond absurdity. Popular as this music was in the 1950's and 60's, it was reviled at the time by hipsters. Why? here's a good place to start: ot was meticulous; the artists and producers were perfectionists. This aesthetic flies on the face of rock 'n' roll, which values energy and spontaneity over technique. Yet many of the pieces included on this album rock--and if they don't rock, they swing. (Some do both: "Julie Is Her Name," by Mambo King Perez Prado was a hybrid style he termed Rockambo.) These recordings were made by bandleaders and musicians who were young and vibrant, and many of whom were considered upstarts and pioneers. However, Space Age Pop stopped short of stripped inhibitions; it wasn't intended to induce breathless perspiration. However raucous the arrangements might get, there was always an undercurrent that whispered: "Relax." There were other reasons why this music was dismissed by many of its contemporaries. It was considered Squaresville. Jeez--trombones and xylophones! Space Age Pop's pedigree can be traced to the elegant big band ballrooms of the 1930's and 40's. rather than to the sweaty, decadent, R&B juke joints. It was genetically "respectable." Does that mean this music has no "soul"? Who cares? Only a pedant with no sense of humor would attempt to address such a question. This music was meant to be festive, to provide a soundtrack for high living. You don't need a penthouse or a velvet smoking jacket, a swinging bachelor pad or a track-lit bar in your living room. But if you close your eyes and relax while listening to Space Age Pop, the High Life is just a dream away. With a bit of persistence, you can still track down original vinyl copies of classic Space Age Pop. If you're lucky, they can be found cheap at yard sales and charity thrift shops. If you venture downtown to your Goldmine-reading used record dealer, along with the obligatory attitude, expect sticker shock. Prices on these LP's have skyrocketed in the past few years, as demand now far exceeds supply. Interest among collectors--and young bands like Combustible Edison and the Coctails--has reaffirmed the vitality of this music. It deserves to be heard. The History of Space Age Pop is one label's attempt to dig out those old master tapes, to find the most imaginative and enduring selections, and provide you with a Soundtrack for Sophisticated Swinging. (Irwin Chusid has produced two albums of quintessential orchestral madness by Juan Garcia Esquivel, Space Age Bachelor Pad Music and Music From A Sparkling Planet (Bar None/BMG), as well as two CD collections of recordings by "cartoon-jazz" composer Raymond Scott.